NEW 2008 KFX®450R INTRODUCES ATV COMMUNITY TO KAWASAKI RACING TECHNOLOGY Motocross performance based on the World Champion KX™450F. Take the short cut to the circuit with the all-new Kawasaki KFX®450R ATV. This high performance machine doesn’t require extensive and expensive modifications to make it race-ready, because it already includes all the race-winning performance and technology required for success straight out of the crate. The KFX450R’s design incorporates everything riders need to win races. Every component was chosen to maximize performance on the track or in the woods and to minimize the fuss of getting there. This highly advanced racing ATV comes with all the performance and technology necessary to put riders at the head of the pack. The KFX450R ATV uses a powerplant based on Kawasaki’s highly acclaimed KX™450F motocross engine. With the addition of an efficient and highly-responsive 32-bit digital fuel injection system, the KFX450R’s engine produces more torque in the low and medium rpm ranges for outstanding hole-shot acceleration. The use of fuel injection helps ensure that the engine’s performance remains consistent and is virtually unaffected by changes in temperature or altitude. 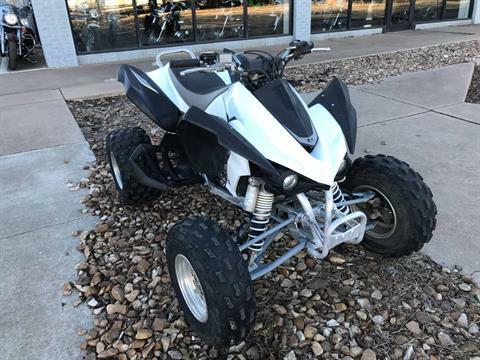 This ATV’s ability to find traction is superb, and its four-stroke torque helps keep the wheels hooked-up for improved handling and higher corner speeDual Sport. Other race-ready features include a lightweight titanium exhaust header pipe and a durable forged piston. Winning at the track depenDual Sport on a chassis that’s built to handle tough race conditions. The KFX450R offers the full benefits of an all-aluminum frame, combining exceptionally light weight with the extreme stiffness needed to win races. However, it isn’t just advanced materials that give the KFX450R its race-winning edge. The front suspension design incorporates extremely long lower A-arms mounted to a single box-section lower frame tube. This results in outstanding response from the front-end. At the rear is a cast aluminum swingarm that provides the ideal balance of flexibility and rigidity resulting in unparalleled traction. The high-tech chassis also features a very low center of gravity and excellent roll resistance. 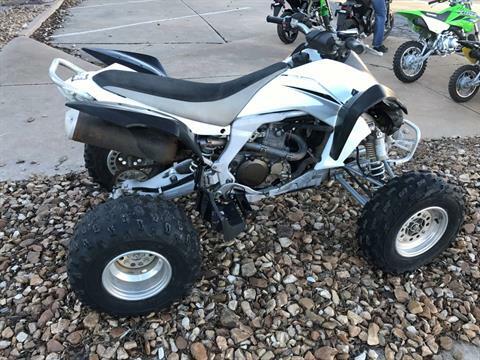 Regardless of changing conditions or rough track surfaces, this race-oriented chassis makes the KFX450R a potent weapon in the battle for ATV supremacy. Competition-oriented equipment, including the only reverse gear in its class, helps keep the KFX fast and reliable. Previously unheard of in racing, the KFX 450R’s lightweight reverse system lets riders quickly extricate themselves from first turn chaos or dead-end trails. This important feature means on-track incidents (like getting nosed-into a wall) no longer result in an early retirement from the race. Kawasaki has also made the KFX450R easy to work on, so riders can concentrate on winning instead of wrenching. The two-piece front and rear “lapped” fenders make it possible to replace sections separately if they get damaged. 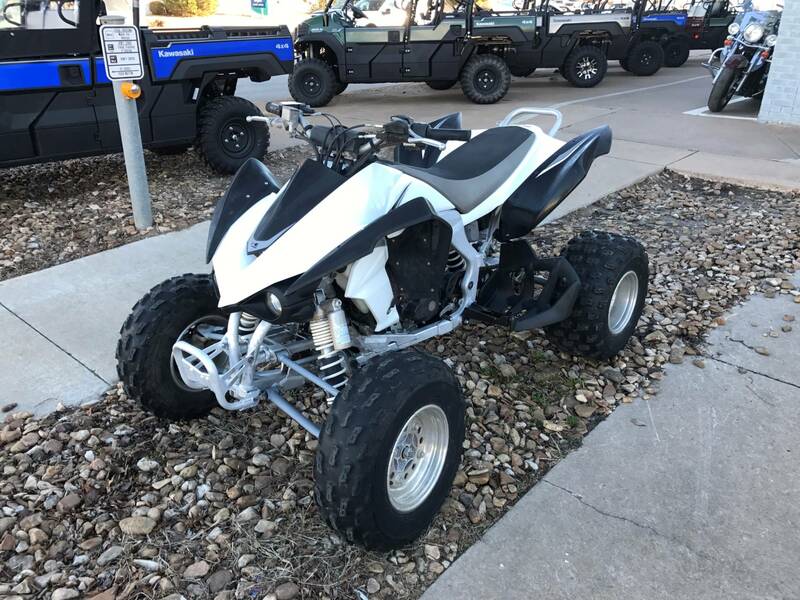 Even the headlight assembly is quickly detachable for closed-course races, and the compact design means that the ATV looks just as aggressive with or without headlights. These features leave little doubt that the new KFX450R was designed to get its rider on the racetrack and winning races as quickly as possible.